almost six months ago and I have been drooling ever since. Yes, I know you've been wondering why I have been carrying this tissue around all that time, and now you know. I didnt' make it right away because I didn't have ramekins to make it in. 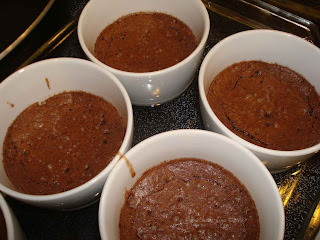 The recipe says you can use an 8 x 8 dish but I think I just needed a good excuse to buy ramekins. When I went to Sistah's in July I found these cute ramekins for just 99 cents each at Chef's Warehouse. 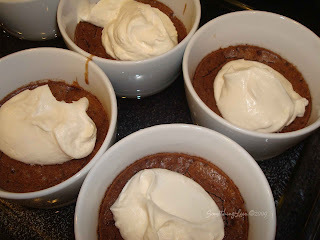 After the fudge bakes for almost an hour you plop on some freshly whipped cream and. . .
prepare to go straight to heaven. 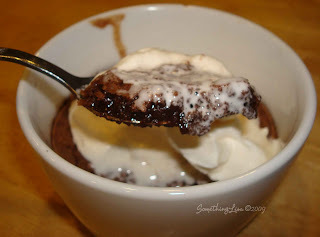 It's kind of gooey and rich and chocolatey and creamy and delicious. I think I need to make it again right now. I assume that you are going to share this recipe, right?